This is a review from listener Helma from the Netherlands of the Sennheiser PXC 550 Wireless headphones. It’s my first review and my first audio contribution so please bear with me. By the way, I’m not an audiophile so don’t expect this review to rant about the sound qualities. My qualifications simply go from ‘horrible’ to ‘nice’. Anyway, Allison always asks us what’s the problem to be solved. Well, actually I had two problems to be solved. These are probably very first world problems, but here goes. My husband likes to watch sports a lot, which I usually can stomach for about 5 minutes. I don’t want to move off to the bedroom or my computer every time I want to watch something else and watching something on my iPad with the TV blasting something different is very difficult. So I was looking for a way to sit in the living room but watch something other than what’s on TV. While preparing for our overdue summer vacation I realised I’d love to have a noise cancelling headphone so I could watch some TV shows on my iPad during the plane trip. And it could double for blocking out the sports noise from the TV. I have the excellent Aftershock Trekz Titanium (yes, Allison your show is very expensive to listen to), but they are the opposite from noise cancelling. 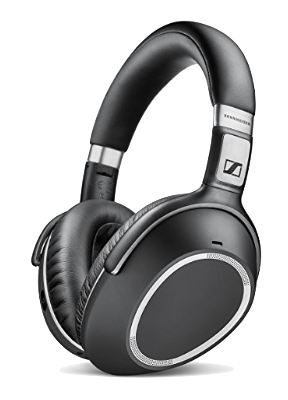 An ad about the Sennheiser PXC 550 Wireless caught my eye and I decided to treat myself and ordered it. It arrived the next day and I immediately was pleasantly surprised by the quality of the product. 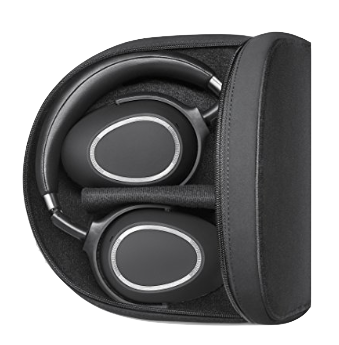 The Sennheiser PXC 550 Wireless is an over the ear Bluetooth foldable headset especially made for travelling. It has NoiseGard Adaptive Noise Cancelling and a 30-hour battery life. I’m a sucker for boxes so the first thing I noticed is the nice travel box. It’s made of soft nylon, but with a stiff front and back. The headphones come packed in the box so you know how to fit them in. And should you forget, the layout of how to fit them in the box is actually printed on the inside. In the hinge of the box is a mesh pocket that holds the USB charging cable, a cable to plug them into the audio jack of your phone or computer and even some extra adaptors for audio equipment and the headphone jack of an airplane. According to the documentation, you can even use them while charging. The headset looks very sturdy and professional with black and aluminium. The headphones can fold because both ear cups can twist 90 degrees as well as collapse inwards so that they can lie flat one next to the other. This is the way they are stored in the box so the box is slightly bigger than a stack of DVDs. It’s also a clever power mechanism. When you rotate the ear cups the headset is powered on or off. Also, if you simply lift the right ear cup off your ear it’ll pause the audio. I wear heavy glasses so I was a bit doubtful if the headset would be comfortable when wearing it for a long time. I experimented by listening to podcasts while walking around the house. With other over the ear headsets this experiment usually doesn’t last very long, but the PXC was so comfortable, I didn’t realise I still had them on after more than an hour. So yes, they are very comfortable to wear and the headband is padded too so no metal grinding into my head and no cups pressing my glasses to the sides of my head. I’ve worn them on a four-hour plane trip and not once were they uncomfortable. The pairing is easy. Right out of the box the headset is in pairing mode and without any effort it paired with my iPhone. It can also pair over NFC by holding the phone to the left ear cup, but I haven’t tested that, not even sure if Apple supports that. The headset can be paired to multiple devices at once, so I’ve paired it with both my iPhone and my iPad. There’s surely a way to easily switch devices, but I haven’t found that one yet. I did notice that sometimes when I pause the audio on one device I get feedback that the headset switches to the other device, but if that’s the only way I have no idea. The headphone comes with a thick manual and who reads the manual anyway, right? The sound is great. I am, like Allison, not a huge music listener. I prefer to listen to podcasts, tv shows and movies and yes, occasionally to music. The sound is very clear and the noise cancelling works great. I watched a TV show on my iPad while my husband was sitting next to me watching a sports game on TV and I had no problem blocking out the game. So problem 1 is solved. There is a little switch on the right ear cup that switches between 2 noise cancelling modes and ‘noise cancelling off’. I can definitely hear the difference between ‘off’ and ‘on’, but not really between the ‘on’ modes. The noise cancelling works great even if the audio is paused. I guess the passive noise cancelling is noticeable then. So no crying kids on the plane and loud engine noises changed into a dull hum. The outside noise is not completely blocked, I could still hear the flight attendants announcements. So problem 2 is solved as well. The headset comes with an app for your phone called Captune, you can find it in the app store, that allows you to select several equaliser presets or create a preset of your own. I haven’t played much with it and just chose one of the predefined ones, which is voice of course. Neither did I play much with the effect modes. There are so many settings, you can spend hours fiddling with it. You can even set the language in which the headset gives feedback. I chose English and a lady with a slight British accent talks to me. The app also has a soundcheck mode where it guides you through all kinds of settings so you can customise the sound to your liking. On the right ear cup is a button that switches through the various effect modes. It was fun playing with it, but I ended with simply ‘speech’ mode. Yes, the effect mode is called ‘speech’ and the sound preset is called ‘voice’. Whatever. The headset has a very nice way of interacting with it. The outside of the right ear cup is actually a touchpad so play/pause is a tap, swiping up and down changes the volume, swiping left and right skips tracks etc. When you reach the maximum volume, you’re informed too and the British lady told me ‘Volume MAX’. There are at least a dozen different gestures and I haven’t memorised all of them, but simply tapping the right earpiece to stop the sound is great, as is the simple way to adjust the volume. The only downside to this is that the touchpad is so sensitive it already reacts when I accidentally brush it with my hand. There is also a call mode. The headset has an array of 3 microphones. You can make and take calls with this headset, although I haven’t tried that yet other than a brief test call to my husband. When showing off this headset to a friend I used the audio cable to connect it to my laptop. And while it was seen as audio output source, I couldn’t get it to show up as audio input source in Skype. Even my little in-ear Apple handset can do that. The Bluetooth range is excellent. I usually wear the Trekz to listen to podcasts while doing my household chores and whenever I wander too far from my desk, the sound starts to drop intermittently so I have to go back and take my phone with me. With the Sennheiser I was far beyond that range and still had excellent sound. Just for fun I’ll record this part with the microphone of the Sennheiser. I haven’t checked the battery life yet. When the headset arrived it had a 60% charge which was depleted after playing with it for some time over the course of a few days. I fully charged the PXC before taking it on our vacation and I used it on both plane trips so well over 8 hours in total. Although I had anticipated otherwise it stayed in its box during the entire 10 days of our stay. I’m recording this shortly after our return and the charge is still at about 60%. So that more or less confirms the 30 day battery life. While the Sennheiser PXC 550 is by far the most expensive headset I ever owned, it’s $399.95 $295 on Amazon, I find it well worth the money. On Amazon.com are very detailed reviews comparing the Sennheiser to it’s Bose equivalent should anyone be interested. You can find more information on the Sennheiser website by entering sennheiser.com, click on ‘Headphones & headsets’, click on ‘Travel’ under ‘Application’ and look for the PXC 550 Wireless: en-us.sennheiser.com/…. Contrarian option. My wife was losing her high frequency hearing, too many years blow drying her long blonde mane. “Downton Abbey” at full volume couldn’t be escaped. Instead of fleeing the house, I set her up with wireless headphones for the television. She could have an immersive experience with the Earl of Grantham, family, and retainers. The dogs, Claws of Satan, and I could live our non-aristocratic lives in peaceful silence.